Scale Aircraft Conversions (SAC) produces an impressive array of white metal replacement landing gear for a variety of models. Some of these sets correct different issues that appeared in production kits, while others are simple common sense replacements to have stronger landing gear on your model. This release is one of more than 60 landing gear sets available in 1/48 scale and is targeted for the Tamiya releases of their A-1 Skyraider. Tamiya's Skyraiders are currently the best kits of the subject in any scale and currently have the A-1H and A-1J variants released. This nicely cast white metal landing gear set provides a nicely detailed option for the AMS modeler as well as a sturdy option for those who need stronger gear for their models. One nice aspect of aftermarket landing gear like these from SAC is that you can make the change anytime, even after the kit's gear buckles for whatever reason. 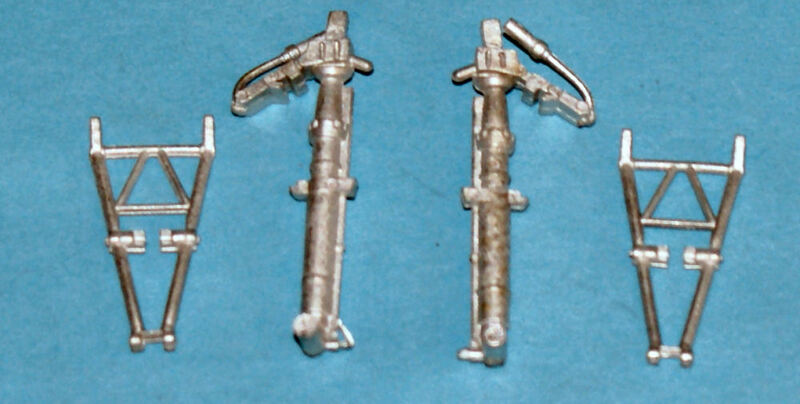 Unlike an aftermarket cockpit or other details that need to be incorporated during construction, you can easily extract the old styrene gear and plug in these replacements once you've got them primed and painted. Of course you can plan ahead and use them during your build-up and avoid the problems in the first place. 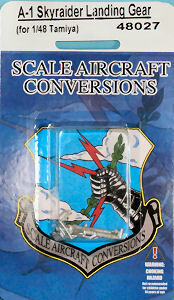 You can obtain SAC landing gear from your favorite hobby retailer or online hobby shop. If your retailer can't get these for you and you can't this set at your favorite online retailer, then you can get quick service from Scale Aircraft Conversions directly. My sincere thanks to Scale Aircraft Conversions for this review sample!